Back when I used to eat potato chips on a regular basis, ‘cheese and onion’ was one of my favourite flavour combos. This recipe is a little healthier celebration of that classic junk food ‘marriage’. 2. Heat a little olive oil in a medium saucepan and cook onion on a medium heat until the onion is soft. About 10 minutes. 3. Remove from heat stir in the cream, half the cheese and the chickpeas. Divide between two 2 cup oven proof dishes (or 4x1cup). 4. Sprinkle over remaining cheese and bake for 15-20 minutes or until golden brown. 5. Serve hot chickpeas with salad on the side. dairy-free / vegan – make a tomatoey version by adding a can of tomatoes with the chickpeas and a good glut of olive oil. Skip the cream and baking step and serve with basil leaves tossed through. home cooked chickpeas – you’ll need about 400g cooked drained chickpeas. carb lovers – replace chickpeas with 300g cooked pasta. more veg – replace some of the chickpeas with cooked veg such a cauliflower, red peppers, eggplant, zucchini, broccoli, asparagus. carnivore – add chopped bacon. more substantial – serve with garlic bread or toss in some cooked pasta. different legumes – use any canned or cooked lentil or bean. 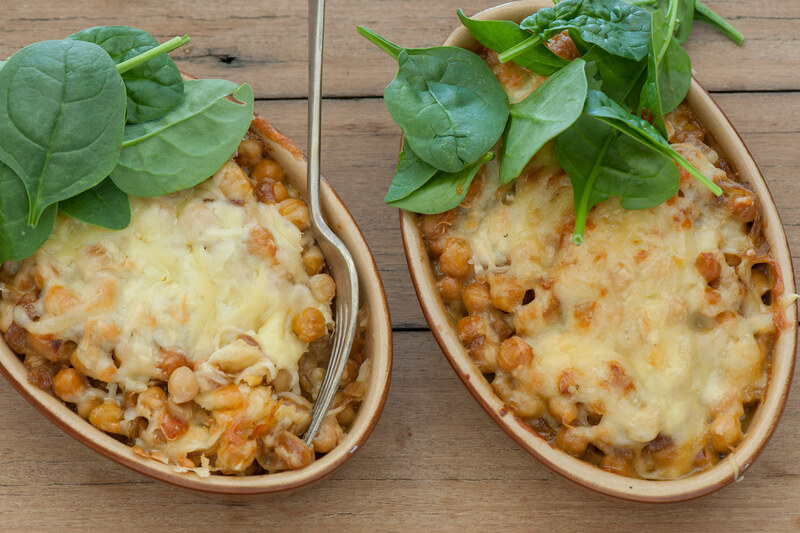 short on time – skip step 4 and just serve warm chickpeas and onion with cheese on top. Or you could simply skip the onion. paleo (grain, legume & dairy-free) – try this chicken & broccoli stir fry instead. cream – freeze it or use for another meal. cheese – most hard and melting cheeses will keep for weeks wrapped in waxed paper or baking paper and stored in an airtight container (or sealed ziplock bag) in the fridge. If you need to store for longer cheese can be frozen. chickpeas – keep in the pantry. salad leaves – are highly perishable. My first path would be to use them for another meal (salad for breakfast!) but if that isn’t possible you can pop them in the freezer. They will wilt down but can then be used anywhere you’d use wilted greens. At least this way they wont go slimey. The first meal of the meal plan and it was delicious! I used 1 can chickpeas and an equal amount of fresh green beans (I pre cooked them). I added fresh thyme. The onions add a perfect sweetness. It made a lot! There is enough left for lunch tomorrow. We like chickpeas, so this is a winner. Thanks!